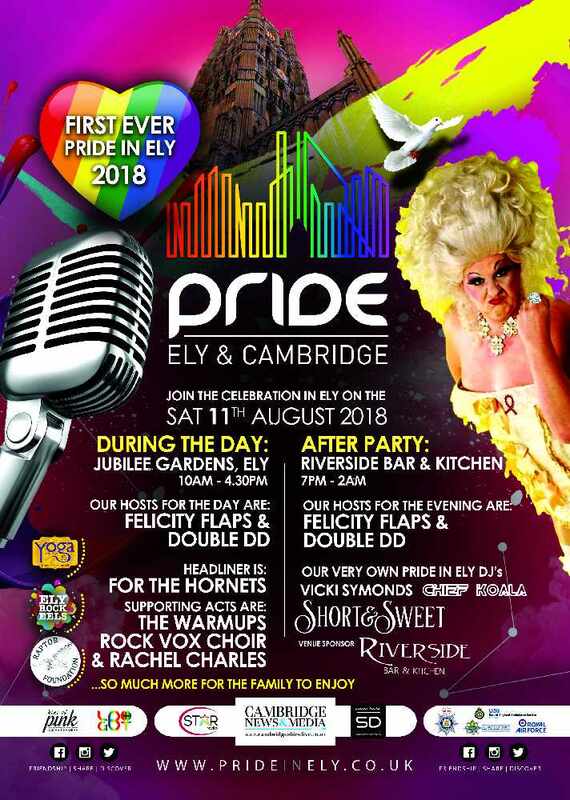 The first ever Pride in Ely event is taking place on the 11th August 2018 and it's completely FREE to attend! The event will be held at the Jubilee Gardens in Ely during the day from 10am - 5pm with music from For the Hornets, who will be headlining the event, and The Warnups, Rock Vox Choir and the ‘Rachel Charles. It will be a great event for the family to enjoy, with The Raptor Foundation, Kids yoga, face painting and much more entertainment present on the day. and the wonderful Chief Koala (Paul R Owens). This is a fully inclusive community event that everyone can be involved with and celebration Pride – not just for LGBT+ but for the Pride of everyone in Ely! Pride is a celebration of the cultures of lesbian, gay, bisexual, transgender and related identities. For more information on the event and to download your FREE tickets, please visit www.prideinely.co.uk.